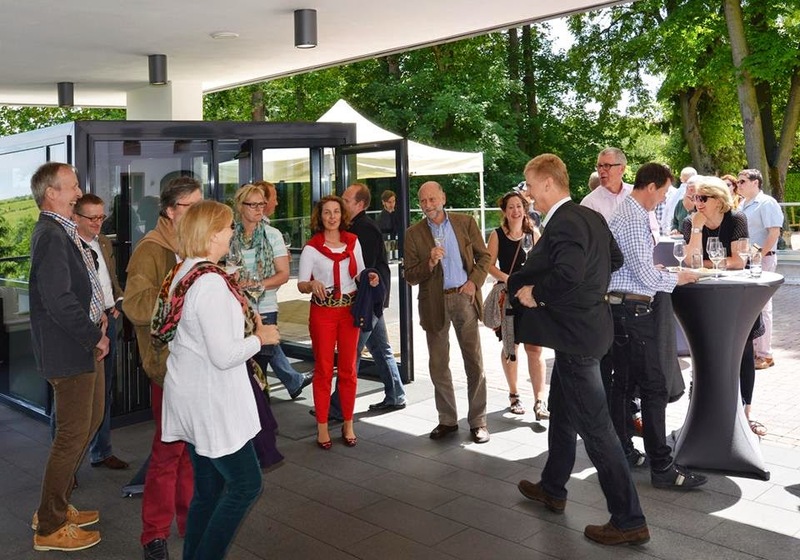 I have already provided an overview about the 2nd International Riesling Symposium event: The 2nd International Riesling Symposium in the Rheingau, Germany and reported about particular events (see below). 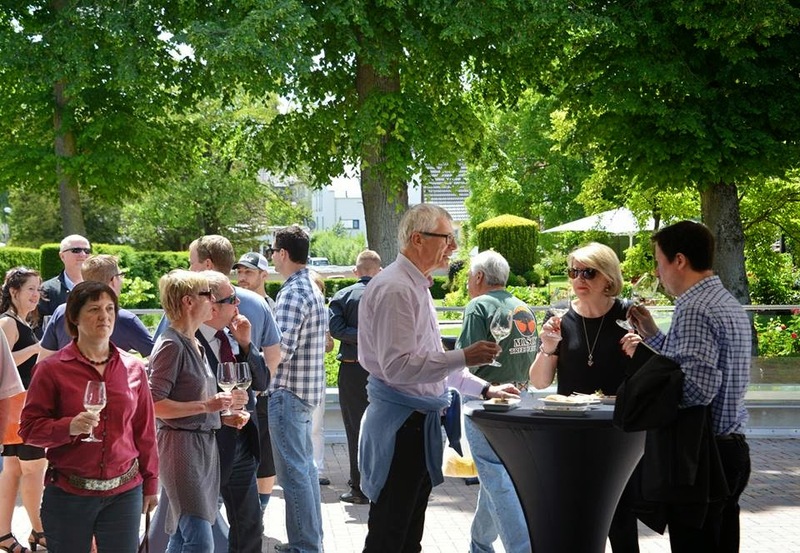 As part of the Symposium, participants were invited to a Rheingau tour on the Sunday, May 25, 2014, with stops at Weingut Robert Weil, Staatsweingüter Kloster Eberbach and Weingut Schloss Johannisberg. We were received by the owners/managing directors Wilhelm Weil, Dieter Greiner (Staatsweingüter Kloster Eberbach) and Christian Witte (Weingut Schloss Johannisberg). We met at 2 pm at Weingut Robert Weil for a flying lunch and cellar. We were a group of about 50 people. Next stop was Staatsweingüter Kloster Eberbach, just a few minutes away from Weingut Robert Weil by bus. There, we toured the famous Steinberger vineyard, the new winery and the old Eberbach Abbey, where we had wines from 1943 and 1953. Managing Director Dieter Greiner was our host. The State of Hessen owns a large number of vineyards, which all come under the umbrella of the Hessische Staatsweingueter Kloster Eberbach. It is Germany’s largest Wine Estate. Most of the vineyard holdings of the Hessische Staatsweingueter date back to the 12th centuries, when Cistercian monks founded the famous Kloster Eberbach abbey here. The Abbey, including its vineyards, was secularised under Napoleon in 1803. The new owner was the Duke of Nassau, then the Prussian Kingdom from 1866, and finally the Federal State of Hessen since 1945. The Hessische Staatsweingüter Kloster Eberbach is made up of 7 estates, including 3 wine producing facilities and cellars. The total vineyard area of the 7 estates comes to 247 hectares, of which 85% are planted with Riesling, 10% with Pinot Noir and 5% with other varieties. The Steinberg is a 32.4 hectares (80 acres) wall-enclosed vineyard in walking distance of Kloster Eberbach. It is one of the most famous German vineyards. The favorite site of the monks, they built a 4 meter (13ft) wall around the vineyard to keep out thieves. This and its Cistercian heritage give Steinberg a distinct similarity to the famed Clos De Vougeot in Bourgogne in neighboring France. The name Steinberg is German for "stony hill" after Stein = stone and Berg = mountain or hill. The Steinberg is one of handful single vineyard sites in Germany which for reasons of historical significance have dispensation from having to include a village name together with the vineyard's name, so the wines from the Steinberg are simply labelled Steinberger. A few years ago, the Hessische Staatsweingueter built a new winemaking facility and celler just outside the wall of Steinberg, the Steinbergkeller. The Eberbach Abbey is a former Cistercian monastery. Its Romanesque and Gothic buildings are impressive. It was founded in 1136 by Bernard of Clairvaux as the first Cistercian monastery on the east bank of the Rhine. The vineyards of Eberbach Abbey were, at 300 hectares, the largest in medieval Europe. The Estate Director Christian Witte and his staff showed us around, including the historic cellar of Schloss Johannisberg, conducted a tasting and, to conclude the tour, invited us for dinner in the garden of Schloss Johannisberg. Weingut Schloss Johannisberg has been making wine for over 900 years. The winery is most noted for its claim to have "discovered" the Spätlese wine, late harvest wine. This, however, is contested by the Hungarians; they claim that the late harvest was discovered in the Tokaji region. The estate changed hands several times during the Napoleonic Wars, but in 1816 the Holy Roman Emperor, Francis II, gave it to the Austrian statesman Prince von Metternich to thank him for his great services. The estate is in the hands of the Oetker family today. The vineyard Schloss Johannisberg is also a single vineyard designation (Einzellage) in its own right. Like the Steinberg, it is one of a handful historic German vineyards which do not have to display a village name on the label. Thus, the vineyard designation on the label is Schloß Johannisberger. There are currently about 35 hectares (86 acres) of vineyard. 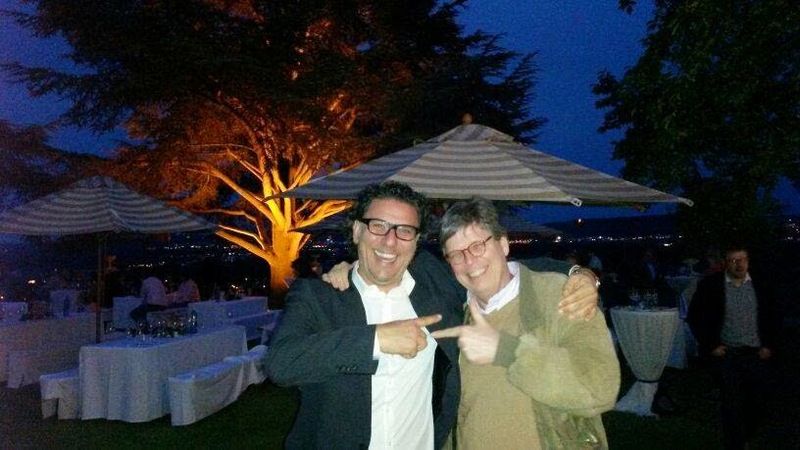 The Oetker family also owns the renown Weingut G.H. von Mumm, also in Johannisberg. Weingut G.H. von Mumm is jointly managed with Weingut Schloss Johannisberg by Christian Witte and his team. 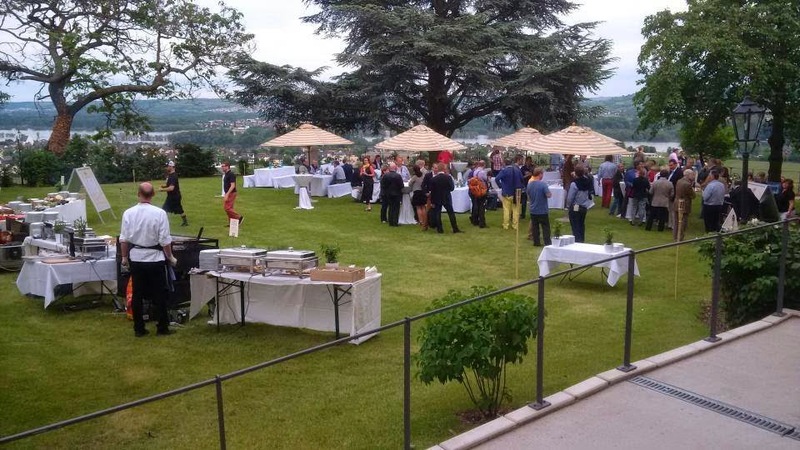 We ended the spectecular tour with dinner in the garden of Schloss Johannisberg. Outstanding food, outstanding company and an outstandign selection of wines from Weingut Schloss Johannisberg and Weingut G.H. von Mumm.